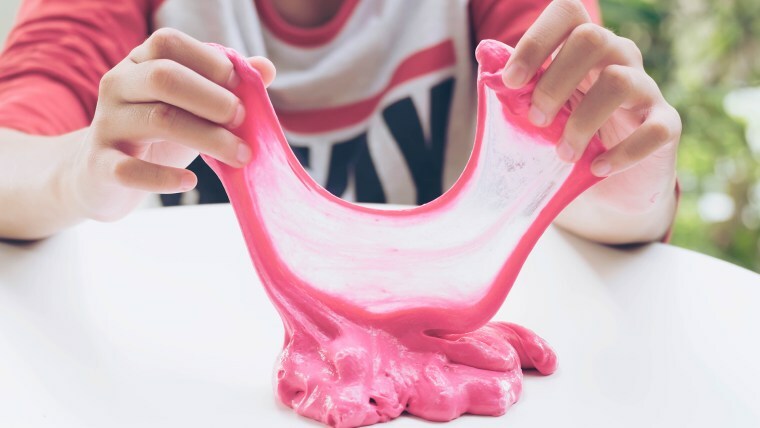 Slime is all fun and games — until its wedged into carpet fibers or in a big, gooey glob on a beloved shirt. Thankfully, these messes aren't as permanent as they initially seem. TODAY Home spoke to cleaning experts to find out exactly how to get slime stains out of anything and everything you own. That way, you can continue squishing and squeezing (and bonding with your tweens) without a worry in the world. Don't worry — slime on your shirt is not as much of a disaster as it may seem. All you need to solve the situation is an ice cube and a little bit of patience, says Clorox laundry expert Mary Gagliardi, otherwise known as Dr. Laundry. Scrape away as much of the stain as you can. Dispose the scraped-off slime, so it doesn’t transfer elsewhere on the item. Use ice cubes to freeze the remaining slime on the fabric, and then scrape the frozen slime away. This will not remove all of the remaining slime, but it’s important to reduce the amount as much as possible. Pre-treat with liquid detergent. Measure a small amount and gently massage it into the stains. Allow it sit on the fabric for 10 minutes (set a timer so you don’t let the product stay on the fabric too long). After 10 minutes, place the treated items in a plastic dishpan and add 2 gallons of hot tap water, rinsing the slime stains as the dishpan fills and stir to mix. Let the items soak for 30 minutes. After 30 minutes, pour off the soaking solution and machine wash the item as usual. This story was originally published Feb. 26, 2018.